The Mintex brand is the most famous when it comes to motorsport. Through intense Research and Development Mintex materials cater not only for Original Equipment and Aftermarket needs but at the other extreme for competition purposes. It is from motorsport that the latest family of Mintex materials have been developed. Known as C-Tech, these materials cover a whole spectrum of vehicles from a typical small hot hatchback for normal day to day use, through to a fully race prepared 700 bhp racing machine. is the material for fast road use as well as light competition such as karting, hill climb and single seater racing cars. One of the main characteristics of this material is the ability to work from cold, which gives the user the confidence of a standard material on the first application of the brakes. The benefit of M1144 is experienced as the temperature within the brakes starts to increase. M1144 will remain stable and consistent through to 450c where a standard material at this temperature will most certainly start to fade. The bedding in procedure for M1144 is the same as any standard material i.e. steady braking for the first 50 miles, avoiding emergency stops. 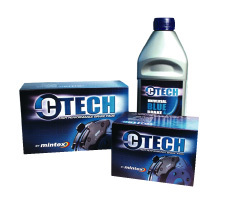 All M1144 pads are supplied with fully branded C-Tech anti noise shims and a C-Tech sticker. is purely designed for competition use and under no circumstances should be used for normal road applications. Applications such as Group A and N rally cars and circuit saloons best suit this material. M1155 has a similar friction level to M1144 but remains consistent to a maximum operating temperature of 550-600c. Like M1144 there are no special bedding in procedures for M1155. is again purely competition use only and is suitable for rally and saloon/sports car endurance racing. The friction level is higher than that of M1155 but remains consistent to temperatures of 700c. Again no special bedding in procedure is required. Please call for prices for other vehicles.